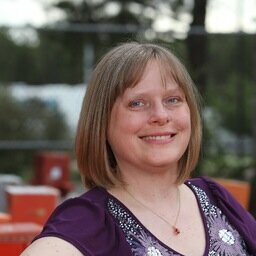 I would like to thank Arlene Hittle for writing this guest post for Miki's Hope. 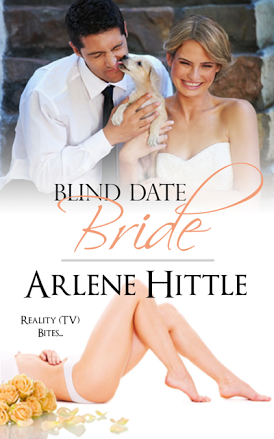 Although I have not read Blind Date Bride (yet) I can almost assure you I will be. It looks to be a delightful book! And if this guest post written by the author is any indication--I am going to love it!! After the guest post I have included a bit about the book itself--so read on! I haven’t always loved watching reality TV shows. In fact, I was proud of myself for successfully avoiding “The Bachelor” and “Survivor” when they first aired. Then I attended a Super Bowl party hosted by one of my roommate’s friends. The new season of “Survivor” premiered after the game...and the host insisted we stay and watch it. By the end of the premiere, I was hooked. channels I used to watch showed nothing but infomercials during the hours I watched TV—so I turned to ID. No infomercials there! some point, it morphed into the “happy” bride and groom agreeing to let cameras follow them through the contest-mandated 90-day cohabitation period. I think I was fascinated by the notion of how the cameras would affect Kari and Damien’s attempts to get to know one another. Of course the camera’s intrusion makes it harder for them to be intimate—witness the many, many interruptions of their hot-and-heavy interludes. However, knowing they’re being filmed also forces Kari and Damien to get closer. She would have been happy to ride out the cohabitation period in his apartment’s spare room had they not been forced to cede it to the camera crew. Instead, she must share his bed—and in so doing, learns to trust him. I guess I’m just a sucker for a happy ending. Of course, that makes my reality TV habit even more puzzling. Those shows aren’t known for producing long-lasting happy couples. out of their sham marriage will be tougher than baking a wedding cake from scratch … with no flour … in a broken oven. marching band required more exertion than golf. Survivor is as far as I can go with reality television. I just don't want to watch a "reality" show that isn't reality. They're all scripted, and the're all trashy. They're just not for me. Reality tv is a seriously easy thing to get hooked on. I'm right there with you! I am a huge reality junkie, so this book is right up my alley. This sounds like a fun read. I don't know, I have a feeling that all reality TV is scripted; some of them are way too crazy to be real! Sounds like an amazing book to read!! I love the show the bachelor it is one of my favorites! Oh, reality TV series are my guilty pleasures! Like it or not, they’re quite entertaining! I love reality TV shows and the more I watch of them the more I want to watch, lol. I'll check out that book as I'm a book worm as well as a reality TV junkie :). There are some reality tv shows I will check out if they are on Hulu or Netflix as I don't have cable. This sounds like a really fun read. I hate to admit that I'm a reality show junkie, too. I love it even though I know some of it, probably most of it is scripted. Happy Watching. I try not to watch a lot of reality T.V. Sometimes, I do glimpse if it's on in the house. This looks very intersting. Sounds like a really great book to read. Thanks for sharing about it. It's ok to love reality tv. I am big Real Housewives fan myself. I watch it to escape from my reality and into someone else's, although so much of that is staged. I used to watch all the reality shows and then I stopped. I felt they were all so scripted. My favourite was Pawn Stars. Blind Date Bride sounds like an interesting read! Adding it to my reading list and I'm loving that there is a paperback version available! I love Survivor and Top Chef, but all those "Housewives" series or daytime court dramas aren't my cup of tea. Nice book review! When I was younger I used to watch those shows. I'm not much into reality tv shows these days though. I couldn't imagine doing something like that! Sounds like a fun read, I'll have to check it out!